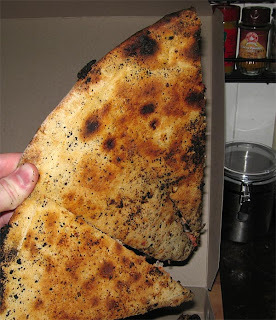 The crust is very thin, but what sets it apart is its char. They get a really nice char around the edges on top, and on bottom the crust is littered with little bits of carbon that taste delicious. The crust at Pepe's is a bit thicker, chewier, with less char. I like both crusts, but gotta go with Modern. With that said, I like the ingredients (particularly the meats) at Pepe's more. Both are places I'll happily go to in the future, both offer superior pizzas, but I surely won't try to go to Pepe's after 5pm on a weekend night again.